The past few weeks have seen a big uptick in my options activity which always keeps things interesting. There was a noticeable slowdown as I adjusted to being back at work and working nights, but I started to get into a routine that allowed me the opportunity to be move active. Now, without further ado let's look the option moves from last week. This one definitely falls into the category of "it's better to be lucky than smart". 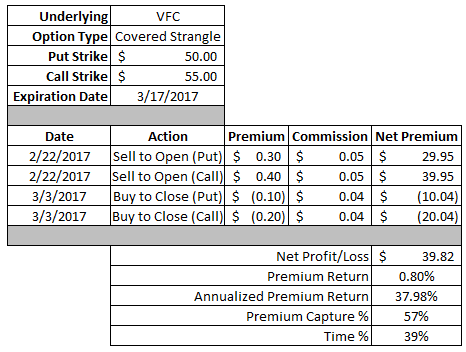 I had originally opened up a $65 strike put option on Target back in mid-January. Fast forward a couple weeks and I decided to roll that contract out in time which I did so for a nice $0.75 credit. As many of you know Target's (Stock Analysis) share price dropped like a rock after announcing earnings last week declining by around 12%. As luck would have it I happened to close out my contract the day before earnings and locked in a nice profit. Although more than anything I'm just glad I wasn't left holding the bag with a short $65 strike put option with just 4 days until expiration while the share price was around $57. In total this put option generated $119.82 of net profit. Based on the $6,500 of capital necessary to secure the contract that's a 1.84% return. The annualized return came to 18.7%. 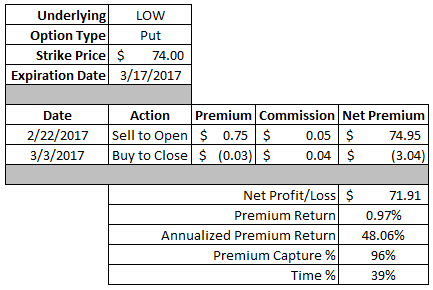 I was able to capture 63% of the premium in 91% of the days until expiration. This wasn't ideal from premium vs. time standpoint, but I'm more than happy to have generated a profit considering what the alternative of waiting another day or two would have done. There's more to come on Target later on! I've been trying to let my options positions go closer to expiration, but sometimes Mr. Market gives you the gift of a share price pop not long after you open the position. This trade provided a net profit of $45.91. 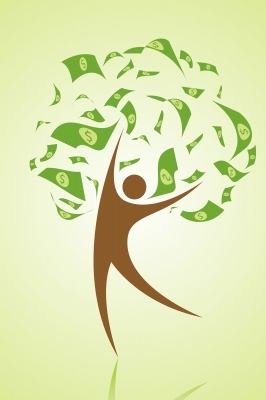 Based on the $8,050 of capital set aside to secure the contract that represents a 0.57% return. Since that return was earned in just a weeks time that equates to an annualized return of 34.6%. With Exxon's share price following the market higher on March 1st that gave me the chance to lock in a good profit and take some risk off the table. I was able to capture 66% of the maximum premium in just 30% of the days until expiration. Similar to the Exxon Mobil put I was able to take advantage of the market's big move up on Wednesday of last week to close out another put contract. Except this one was done even quicker since I only opened the position on Monday. But if you're trading options you need to take advantage of the opportunities when they present themselves. This Union Pacific put contract provided a net profit of $49.91 which is a 0.48% return based on the $10,300 of capital to secure the contract. Since that return was earned in just 2 days that's a whopping 141.77% annualized return. If Mr. Market gives me a chance to secure 67% of the maximum profit in just 11% of the days I'll take that every single time. 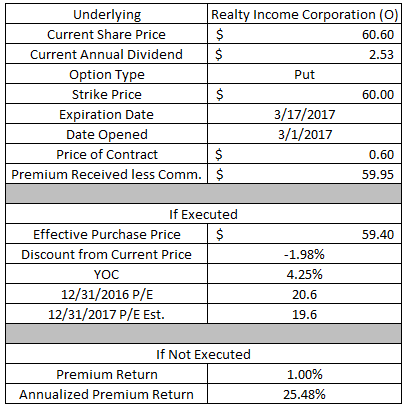 Realty Income is one of my favorite picks in the REIT space and it's hard to argue against them given their history. They have arguably the best management around with a dividend growth streak spanning 20+ years. The problem right now though is the valuation. I went a bit more aggressive with this contract and since I'm not excited about my potential purchase price I'll probably look to manage this one early if the markets have a pop. If Realty Income's share price falls below $60 then I'll have to purchase 100 shares at an effective purchase price of $59.40 or about 2.0% lower than where the share price was trading when the position was opened. That's not ideal with a trailing P/AFFO of 20.6x and a foward P/AFFO of 19.6x, but I think Realty Income might not have a lot of downside since rate hike expectations are pretty high. My YOC at that purchase price would be 4.25%. If Realty Income's share price remains above $60 then I'll get to keep the full premium as profit. That would represent a 1.00% return on the $6,000 of capital to secure the contract and a 25.5% annualized return if held until expiration. After seeing that 12% plunge for Target after releasing earnings that got me interested to see if there was any potential option plays. Especially since the IV was jacked up with a move that large. This is more of bet that the selling was overdone so we'll see how this one turns out for me. If Target's share price falls below the strike price then I'll have to purchase 100 shares for $57.50. Since I received $53.95 in option premium that reduces my effective purchase price to $56.96. The valuation looks compelling, but one thing you'll notice is that the forward P/E is higher than the trailing P/E. So that means further earnings weakness ahead. Yikes! 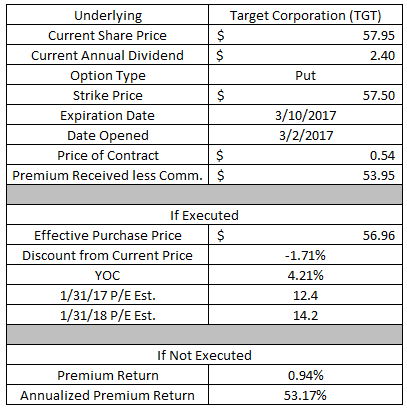 If Target's share price remains above $57.50 then I'll get to keep the full $53.95 option premium as profit. That would represent a 0.94% return on the $5,750 to maintain the contract of a 53.2% annualized return. If I had a say in how this plays out this contract would just expire OTM, i.e. the share price > strike price. However, if the shares are put to me I can think of worse things to own than a Dividend Champion at a 4.21% YOC. They say to buy when there's blood in the streets and Target fits that to a "T" right now. Pfizer is a new one for me regarding options moves. Unfortunately many of my preferred companies have seen their share price rise significantly over the last few months which means I have to be on the lookout for new companies to execute my option strategy. Also with the calendar turning to March that means I needed to look for some new positions with some April expiration dates. Typically the 30-45 day window is right before the theta, time value, for option contracts starts seeing higher decay. I decided to be quite aggressive with this contract and sold the ATM put option. The ATM options give the most bang for your buck in terms of option premium, of course they come with the odds essentially being 50/50 as to whether the contract expires ITM or OTM. 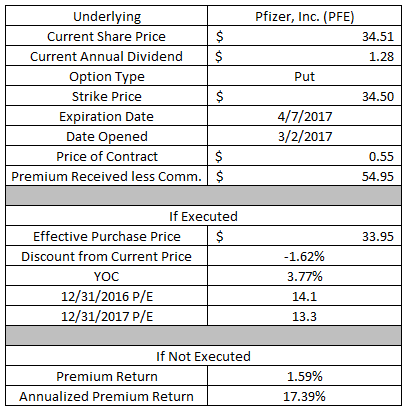 If Pfizer's share price falls below $34.50 then I'll have to purchase 100 shares at an effective purchase price of $33.95. The valuation looks solid there with a trailing FY P/E of 14.1x and a forward FY P/E of 13.3. The YOC at that price would be 3.77%. If Pfizer's share price remains above $34.50 then I'll get to keep all of the option premium as profit. The $54.95 premium would be a 1.59% return based on the $3,450 of capital necessary to secure the contract. The annualized return would be 17.4%. Nike (Stock Analysis) has been one of my preferred stocks to sell puts against because I think there's still a lot to the growth story here. Despite the low starting yield the dividend growth has been fantastic and there's room for both continued 10%+ growth alone as well as the potential for payout ratio expansion to boost it even higher. I decided to sell a slightly ITM contract on Nike because I'm still quite bullish on its share price. If Nike stays below the $58 strike then I'll have to purchase shares at an effective purchase price of $56.95. That's about a 1.5% discount from where shares were trading when the contract was opened. The valuation doesn't look great, but it's reasonable considering the growth prospects of Nike. On a trailing FY basis the P/E would be 26.4x and the forward FY P/E would be 24.3x. My YOC would be 1.26%. If Nike's share price continues to rally higher and move above the $58 strike then I'll get to keep the full option premium as profit. The $104.95 option premium would represent a 1.81% return on the $5,800 capital to secure the contract. On an annualized basis that's a 54.8% return. Visa (Stock Analysis) is another one of my "old faithful" companies to write put options against. Like Nike the valuation isn't ideal, but the growth story is still firmly in tact for Visa. If Visa's share price falls below the $87.50 strike then I'll have to purchase 100 shares at an effective purchase price of $86.68. That would be at a 2.1% discount to where shares were trading at the time the contract was opened. The valuation isn't great with a trailing P/E of 30.5x and a forward P/E of 26.0x; however, Visa can quickly grow into that valuation thanks to the move towards less cash payments. The YOC at that purchase price would be 0.76%. If Visa's share price remains above $87.50 then I'll get to keep the full option premium as profit. That would be a 0.94% return based on the $8,750 required to secure the contract. The annualized return would be 12.5%. Lowe's (Stock Analysis) announced earnings last week that were absolutely stellar and guided above the analyst expectations. Investors loved the earnings release sending shares higher by 9% on the news. Since I've still got a long ways to go before I'll be needing to use dividends to cover our expenses I've been focusing more on the higher growth/lower yield companies. The fact is many of those are just as high quality, but are trading at much better valuations than the slow and steady consumer staples that I'd like to add to my portfolio. If Lowe's share price falls below the $77.50 strike I'll have to purchase 100 shares at a cost basis of $76.72. That would be at a 4.6% discount to where Lowe's was trading at the time the contract was opened. The valuation looks really strong at that purchase price. The trailing P/E based on the recently ended fiscal year would be 19.2x and the forward P/E would be just 16.5x. The YOC based on my purchase price would be 1.82%. If Lowe's share price remains above the $77.50 strike price then the full option premium will be kept as profit. That works out to a 1.01% return or 13.4% annualized. 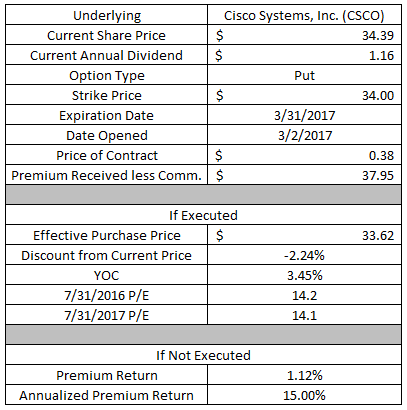 I've been eyeing Cisco (Stock Analysis) for several years now, but never pulled the trigger on a purchase. I'm not really sure why, but likely it was that I saw better opportunities in more "tried and true" dividend growth companies and wanted to build those up first as I expanded my portfolio. If Cisco's share price falls below $34 then I'll become the proud owner of 100 shares at a purchase price of $33.62 which is about 2.2% below the current share price. The valuation there looks decent at 14.2x on a trailing FY basis and 14.1x on a forward FY. The YOC would be a strong 3.45%. If Cisco's share price remains above $34 then I'll get to just pocket the premium as profit. That would be a 1.12% return based on the $3,400 to secure the contract and 15.0% annualized. Aside from the solid return prospects for this contract I chose this expiration/strike for a reason. Since it's very close to being ATM the premium is relatively rich, but it's also because the next ex-div date is April 4th so I'll get to collect the next dividend payment if the shares are put to me. That would effectively reduce my cost basis by another $0.29 to $33.33. For the positions that I own in my Rollover IRA I've stared implementing a covered strangle strategy. The covered strangle is created when you own 100 shares of stock, sell 1 OTM put option and 1 OTM call option. By selling 2 contracts you collect more premium, but you risk possibly "doubling down" on your position or selling shares for less than the current market price. That's a risk that I'm willing to make since I have ample cash reserves in my Rollover IRA. If CVS' share price falls below the $78.50 strike of the put then I'll have to buy 100 more shares. My effective cost basis on the new shares would be $77.63 reducing the cost basis for my entire position to $80.42. If CVS' share price rises above the $84 strike of the call option then I'll have to sell my existing 100 shares. 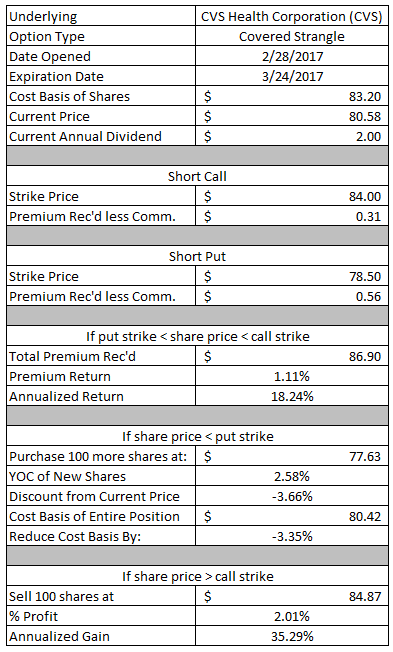 The sale price, call strike + total premium, would be $84.87 or 2.01% higher than my current cost basis. Based on the time from when the contract was opened until expiration that would be a 35.3% annualized return. Although ideally CVS' share price would just stay here in between the two strikes while I let time do its thing. 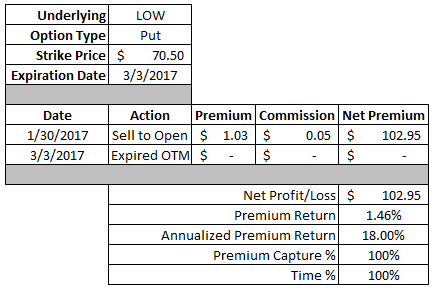 If that happens both the call and put option would expire out of the money and I'd get to keep the full option premium as profit. The $86.90 in premium would be a 1.11% return on the $7,850 of capital to secure the put option. The annualized return would be 18.2%. With most of the option positions that I put on I try to look for opportunities to lock in a profit by closing the position out early. Regarding my VF Corporation covered strangle we were in kind of an odd time with the monthly option cycles when I decided to put it on. We were too close to the March 17 expiration, but a bit too far from the April 21 expiration. At the time I decided to sell the covered strangle with March with the plan of closing it out early around this time in March and then selling the April with about 45 days to expiration. That's right about the time the time value of options really starts to pick up steam which is great since I prefer for VF Corporation to just sit here. It doesn't happen often, but it's fun when your plan actually comes to fruition. The covered strangle provided a net profit of $39.82 or 0.80% based on the additional $5,000 of capital in play. The annualized return came to 38.0%. I was able to close the position out early and lock in 57% of the maximum profit in 39% of the days until expiration. I'll be looking to re-establish this position except on Monday in April's expiration cycle. The home improvement retailers, Lowe's and Home Depot (HD) are some brick and mortar retailers that are doing just fine in the move towards e-commerce. I think a lot of that has to do with the fact that if you need something you need it now, not in a couple days. After reporting earnings last week Lowe's share price had a huge jump increasing 8% or so the day of earnings. With just a couple weeks to go until expiration that gave me the opportunity to close the position out early to free up the capital set aside for this contract. I was able to generate a net profit of $71.91 or 0.97% based on the $7,400 securing the position. That's an excellent 48.1% annualized return. I was able to capture 96% of the maximum profit in just 39% of the days. I chose to close this one out early because there was nothing but risk left on the table. If I held through until expiration I only stood to make an additional $3 while being at risk of the market changing directions and wiping out all profits. It just didn't make sense to leave this position on just to make a relatively little bit more in profit. It made more sense to close out the position and look for opportunities to reestablish a new one, which as you can see from above I already did. Sometimes though I let things go all the way until expiration. With Lowe's announcing earnings last week the IV was still high and it was just too expensive to close out the position that close until expiration, especially since my idea was that Lowe's would have a good earnings report. Since this contract expired OTM I was able to keep the full $102.95 of option premium as profit. That's a solid 1.46% return on the $7,050 of capital securing the contract or 18.0% annualized. 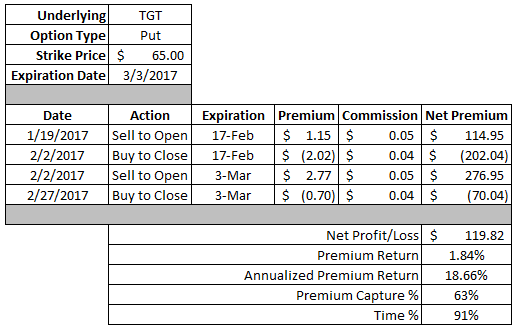 For February 2017 my option profits totaled $1,527.73 and thus far in March I have gains of $310.50. Year to date I've generated a total of $3,467.62 in option income. it looks like a sure win when you pick high quality companies, write the option to collect the premium, if things doesn't work out, you'd still get the dividend. I wouldn't want to gamble against you. You have this system so well thought-out! For February 2017 my option profits totaled a little above 1900 euros.